What Will Come of USA’s Women’s Worlds Boycott? For 17 years, Canada has faced their U.S. rival in the final of the IIHF Women’s World Championship, and that streak may now come to a crashing halt. Players on the defending gold medal team announced they will not participate unless significant change comes in the form of fair wages and equitable support from USA Hockey. Over a year long negotiation with USA Hockey was taking place with the players asking for equitable support in the areas of financial compensation, youth team development, equipment, travel expenses, hotel accommodations, meals, staffing, transportation, marketing and publicity. The announcement comes at a strategic moment as the world championship, set to start March 31, happens on their home turf in Plymouth, Michigan. "I think this will definitely change the map for our sport. It's going to change the way people view the sport. I think it stinks that we have to do it this way because yes, I want to play. That is my passion. At the same time, it is exciting and I was anxious to get out there and speak about the things we have been battling for so long. I have been in this program for 10 years and have kept the good face and now it's like no, these things have to change and we want people to know about it," said Knight. Canada’s national women’s hockey team said they still have their focus set on gold at the IIHF Women’s World Championship, albeit their familiar foe might not be there. “It is difficult to imagine, but we respect their decision” said Lauriane Rougeau, a defenceman on Canada’s roster, who added the news was a shock as she was not aware of their situation. USA Hockey issued a statement that they are disappointed the players are not intending to participate in the world championship and that they do intend to “field a competitive team” for it. Canada is scheduled to play number-one ranked U.S. on opening night, an event that has in years past played in front of a sold out crowd. U.S. player Monique Lamoureux-Davidson had an emotional response to the USA Hockey via social media saying it is an insult to say only some players are requesting change. She said is is a “sad day” when USA Hockey is open to fielding another team rather than listen to its players who devoted their lives and careers to their program. Knight said they have support from retired U.S. players like Cammi Granato and Angela Ruggiero. As well, younger players in the system are in their corner and if it comes down to a second roster playing for the U.S., it will not be of equal calibre. On Canada’s national team, 17 of the 23 players have club teams in the Canadian Women’s Hockey League. While they do not get a wage in the CWHL, they do receive medical benefits and some equipment. Most CWHL players work around their jobs to play in the league, however it is rumoured the time where players will get paid to play is getting close as the league slowly and strategically grows. Carded members of the senior national team receive $1,500 a month from Sport Canada on a yearly contract. Financial support is dispersed through the Athlete Assistance Program which gives direct financial support to selected national team athletes. Hockey Canada tops that total up to around $2,500 when players are centralized as they train full-time in the nine months leading up to the Olympics. 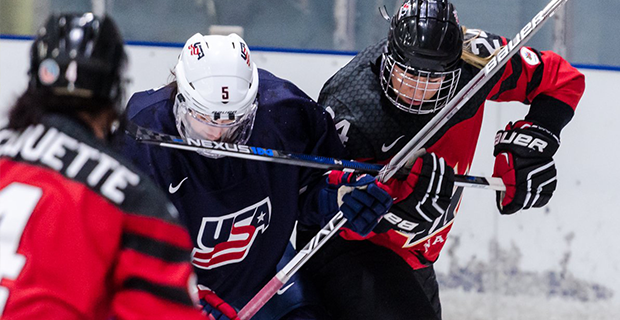 Hockey Canada has a different structure than USA Hockey where players representing each developmental level are represented on the women’s high performance advisory committee to work with concerns and needs of players. They are currently in the process of working on the contract for when players will be centralized, starting this summer for Olympic preparation. Some of the players that sit on the committee include chair Caroline Ouellette, Rougeau and Brianne Jenner who represent the senior group. The advisory board essentially acts like an NHLPA. “We feel our relationship is very strong … we talk regularly around agreements and contacts and what the players need and where we are at as an organization. We are comfortable where we are at, and I’m not saying we always agree, but we always get to a really good point in the best interest of the game and moving forward with our team,” said Mel Davidson, Hockey Canada’s general manager of national women’s team programs. All of the U.S. women, who are not in college, play in the fledgling four-team National Women’s Hockey League where they do make a paycheque, albeit a measly one compared to their NHL counterparts. Only in its second year, the NWHL had to cut wages this season in order to stay afloat. In its first year, wages ran from a minimum of $10,000 to the maximum of $26,000. Only U.S. national team member Amanda Kessel on the New York Riveters earned the maximum. Other national team players, like Knight who also plays for the Boston Pride in the NWHL, depend on earning money through hosting hockey skill camps, having a second job or getting sponsorships to help them scrape by to pay for housing, food, clothing and some of their hockey gear. USA Hockey said the support they are implementing for their national team as it prepares for the 2018 Olympics includes additional stipends and incentives for medals that could result in each player receiving nearly $85,000 in cash. That is in addition to a housing allowance, travel allowances, meal expenses, medical and disability insurance and infrastructure for elite level support staff. But Lamoureux-Davidson said that USA Hockey’s response was misleading and that no offer of $85,000 was extended. She added that out of the six months, the bulk of the money could come from the U.S. Olympic Committee, which pays gold medal-winning athletes more than $60,000.